Managing a medical office in New York is very hard as you may imagine, with so much competition and so many other things going on around you at all times. However, finding the best services for cleanliness and cleaning is very important as – without a doubt – cleanliness and visual appeal is one of the biggest draws for any medical office. If you are offering medical advice and a service built around providing people with a chance to improve their quality of life and their health, you need to be giving them the cleanest and most comfortable environment possible to come and discuss this. 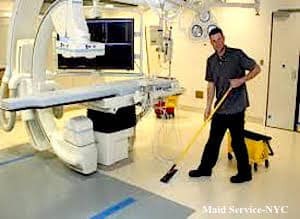 This is why, at Maid Service-NYC, we offer such a comprehensive medical office cleaning service. This service is built around your own needs first and foremost, as we build each job that we undertake around the budget and the constraints of our clients. Also, very few medical offices are the same so it’s important for us to know what we are cleaning. To do this, we undertake a full evaluation of your premises and make sure that what we are dealing with is going to be as capable and as comfortable as it possibly can be. Our medical knowledge and our cleaning expertise means that our team of cleaning ladies can clear up and deal with problems with impunity, leaving you with a business that looks stunning and is far more capable of running itself and attracting clients than it would have been in the past. One thing that you need to think about, too, is the massive range of changes that need to be implemented in any medical environment. For successful cleaning in a medical office environment, you need to have the right services working alongside you. They need to be experienced in the medical department as well as well-informed about best health practices and what to look out for when cleaning. Well, all of our staff will do this for you – they’ll keep an eye out on the world around them. Our cleaning ladies and maid teams will be able to get involved far more regularly than they used to be able to, ensuring that the cleaning can be delivered comprehensively. Given the way that medical office cleaning has changed over the years, we make sure that all of our staff have the full knowledge of what to do. For help in arranging medical office cleaning services, contact us 212-729-4629 or e-mail: office@maidservice-nyc.com for more details and we’d be happy to help.